Date of introduction: 1987 Display technology: n.a. The wonderful Touch & Discover game combines the position sensitive keyboard design on the previous Touch & Tell with the enhanced speech synthesizer technology of the Super Speak & Spell. The idea of the product is simple: Switch the game on and wait for the instructions. The only thing you need is your fingertip. Don't miss the rare Touch & Discover School Edition. 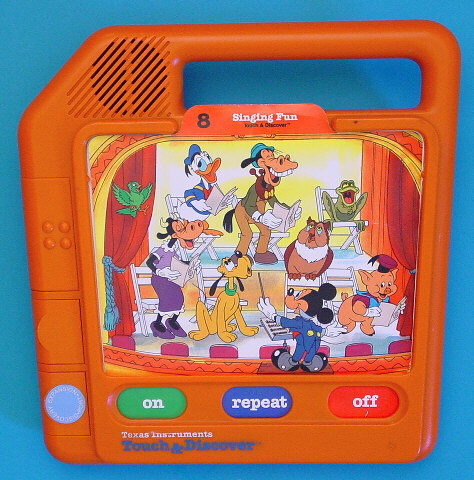 Each expansion pack contains a cartridge and a set of educational Disney picture panels. The cartridge itself uses a Speech-ROM TSP60C21 connected to the expansion port of the Touch & Discover. The Touch & Discover toy is based on the TSP50C42 standard voice synthesizer chip and an external Speech-ROM TSP60C19 or TSP60C21. Few years later Texas Instruments introduced the smaller Teddy Touch & Tell. Don't miss the El Super Libro Mágico with its wonderful Spanish language, the Italian speaking Super Libro Parlante and the French speaking Le Super Livre Magique. 6 Numerical Quantity/Counting 14 One More or Less 30 Who Comes Next ? The Touch & Discover is featured in the Texas Instruments Incorporated bulletin CL-974 dated 1988 and in the Texas Instruments Incorporated leaflet Follow the Learning Path™ dated 1991.